Do you want to not worry about money anymore? Do you want to build real lasting wealth? Then you’ve come to the right place. In America our money culture is horrible. We consistently preach what needs to be done, but action just doesn’t happen. Today 2/3 of Americans can’t cover a $1,000 emergency and the average national savings rate is under 5%. If we choose to be average and be like everyone else, we will never build significant wealth. Too often I hear people of all ages mention something along the lines of “Yeah, I need to get started on looking into investments or retirement.”, and nothing happens. 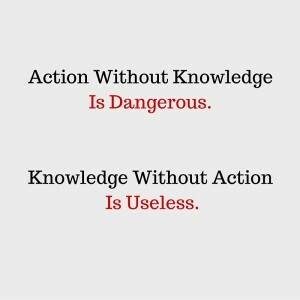 Taking action TODAY is crucial to long term success. I truly believe it is possible for everyone in this country to get ahead and build wealth. We have more access to information and investing opportunities than any other generation in history. I grew up in a trailer park and watched as my parents were able to move up substantially over time in wealth. For most of my childhood they worked well north of 40 hours a week, with several years averaging over 60. My mom went to school at nights while working those hours to finish her Bachelors degree. They started with nothing (and had kids young), and retired early by our standards at 55. They were also able to pay for both their kids to go through college. When I moved out at 18 I worked at KFC for 3 years in Benton Harbor, MI. I met my future wife, Mrs. C, who had a young son. We moved into an apartment together for a year, then moved into her mom’s basement for 6 months while saving up for a down payment on our first house. We bought our first house shortly after I turned 20. It was a $47,000 foreclosure in Benton Harbor. With 5 more years of working and saving we decided to move and found the perfect home a few miles away. Our house now is a 5 bedroom tri-level on 3 acres, and we recently purchased an addition 8 acre railroad bed that is adjacent to our property. My wife Mrs. C and I have a total of 4 boys. Our kids are 15 and 10, and we have custody of our nephews who are 6 and 5. I’m in my early 30s and work seasonally as a nuclear outage contractor. I work between 6 and 9 months a year, but during this time I am usually working 12 hour shifts 6 days a week. I started this blog in 2013 and at the time I had a savings rate of around 20%, which I thought was pretty darn good. Today our family is hitting a savings rate of over 40%. Action Economics is read by over 12,000 unique visitors a month from 111 countries. Thinking about money and writing these articles is perhaps one of the keys to our success. It keeps me focused on money and forces me to research new ideas and to make greater effort to maximizing the utility of our money. 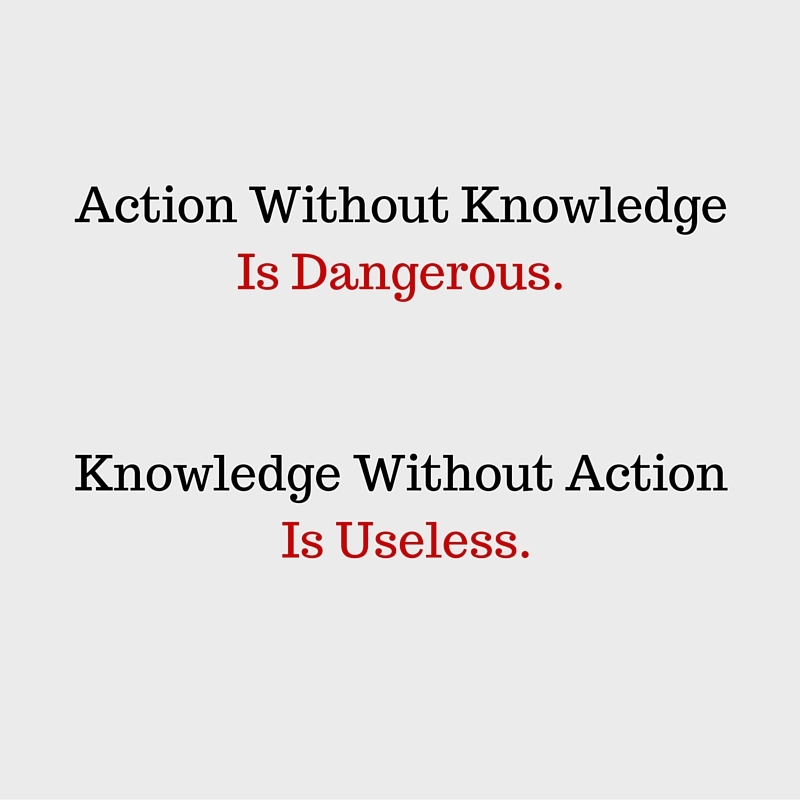 There are over 300 articles on Action Economics designed to help you make the most of your money. 1. Maximize The delta: For the average American family, if you cut expenses by 10% and increase your income by 10%, it will result in a 600% increase in yearly savings. Once you accomplish this, continue to challenge your income and expenses further to grow the difference and take the savings rate challenge. 2. Buy a modest house with 20% down on a 15 year loan: If the bank is willing to lend you $200,000, find a home for $100,000. For most Americans their home is 25% – 33% of their monthly expenditures. By buying a less expensive you can easily boost your long term savings substantially. If your home is instead 15% of your monthly income, you are automatically able to save 10% – 18% more than the average family. Getting a 15 year loan also speeds up the loan amortization dramatically so that you build equity substantially quicker. 3. Invest consistently and automatically: Every week I’m investing. Every single week. There are automatic withdrawals from our checking accounts that go into our IRAs, our HSA, and our taxable account. By investing automatically I am forcing myself to save and I am ensuring that dollar cost averaging is taking place. It is highly important to invest as much money as possible as quickly as possible to have compounding and time work to your advantage. 4. Optimize Your Taxes: What I love most about saving money is that it helps me save more money. Every dollar I save gives me at least a 19.25% tax break. For many people it is even higher. I am in the 15% federal bracket and the 4.25% state bracket. Every dollar put into 401K, IRA, and HSA accounts reduces my taxes by 19.25%, but wait, there’s more! I also qualify for the retirement savers tax credit, which gives us $400 per year in a tax credit. Depending on your AGI the maximum tax credit for a married couple is $2,000 per year. 5. Know your numbers, and challenge them: Sit down and take a couple hours to figure out your current annual income, annual expenses, and savings rate. Then look at how you can change these numbers to increase your total dollar savings for next year, and the year after that and so on. Then look at all your assets and debts to figure out what your net worth is. Coupled with your savings rate you can no project how much your net worth will increase in the future. I personally use Personal Capital to track my net worth and spending. It links all of my accounts together so I don’t have to log into a dozen different accounts and write everything down and do math every month to figure out where I’m at. 6. Learn about Social Security, and Portfolio withdrawal rates to change your mindset: Everyone throws around the “4% rule” for achieving financial independence, which I think is unbelievably conservative. I think withdrawal rates up to 7% are reasonably safe and make a lot of sense. Using a 7% withdrawal rate requires only 14.25 years of expenses saved up Vs. 25 years of expenses using the 4% withdrawal rate. If your target is reduced to 50% of its original amount the journey to financial independence isn’t nearly as long. 7. Protect Yourself: Buy term life insurance, today. Right now. We all think it will happen to someone else, but remember we are someone else to someone else. My sister in law died at 21 with 2 young kids and no life insurance. Social Security survivor benefits are not a lot. We are doing pretty good financially with raising these kids, but a $250,000 life insurance policy would have made a world of difference, and the cost to her would have been about $10 a month. 8. Build a legacy: Figure out what you care about in this world. If you have children and may someday have grandchildren, consider setting up a system to build generational wealth. This will ensure that money won’t be a factor in holding them back for getting a decent education, from starting a business, or getting started in life. Getting that first bit of traction in building wealth is by far the hardest part. Then look elsewhere. Look at charities that are doing good work to reduce suffering, or look at conservation projects, or your local school, or just help people in your daily life. How cool would it be to be the “Secret Santa” That hands out $100 bills to people he comes across in Walmart or at the gas station? Achieving financial independence is the first step that opens up an entirely new world. As stated above, our savings rate is approaching 50% and we earn under $100,000 per year. Between Mrs. C. and I we work for 4 different employers throughout the year. Currently none of them offer a 401K match. For a few years Mrs. C. received a 401K match from a previous employer, but it was very little. 99%+ of our contributions to retirement funds do not come from our employers. Every quarter I give a detailed roundup of where we are financially. We are actively paying off our house and putting between 40 – 50% of our savings on our house. We plan to pay off our mortgage, which started at $116,000 in 2011 by the end of 2021. We are saving aggressively in our retirement accounts, which greatly helps us minimize our tax bill, and it lowers our health care expenses through the Obamacare exchanges. We try to keep at least 6 months of expenses in cash at all times. It took us several years to get this emergency fund built up. 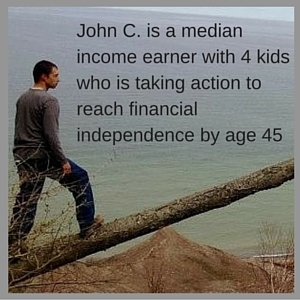 When I started Action Economics my goal was to hit financial independence by 45. I have now revised that to 40 based on our increased income and adjusting our savings goal from a 5% withdrawal rate to a 7% withdrawal rate. After hitting Financial Independence I will continue to work and most likely will not pull from our nest egg for at least a decade. When every dollar I earn is essentially discretionary income we will be able to focus on building a legacy and being incredibly generous. We will assist our children in launching in life and starting their path to financial independence and we will gift a large sum of money to our grandchildren when they are born. I hope with this blog to continue my financial education and to share my passion for finance with others, while providing concrete achievable information about action steps that can be taken today to make drastic changes in your long term financial picture. Most of the information and advice I write is geared towards lower and middle income earners in the “working class”. Check out every post I have written here. Education should never stop! Thanks for sharing your passion. You are a cool guy, John C. I really like where this blog is going. You mention elsewhere being in MI, near Lake MI, and near a park with a fountain. Are you near St Joe? Yes, I live about 5 miles from St. Joseph, MI. I was talking about the Whirlpool fountain right below the bluff. Cool! We’re in the Holland area. Nice to see a blogger that lives nearby. Just discovered your blog. Good intro. Looking forward to reading some posts! The road to financial freedom is an exciting one. Hi! It’s nice to see another personal finance blogger from Michigan! We are up in the Traverse City area 🙂 Let us know if you are coming up this way! likewise, very cool! Will do.